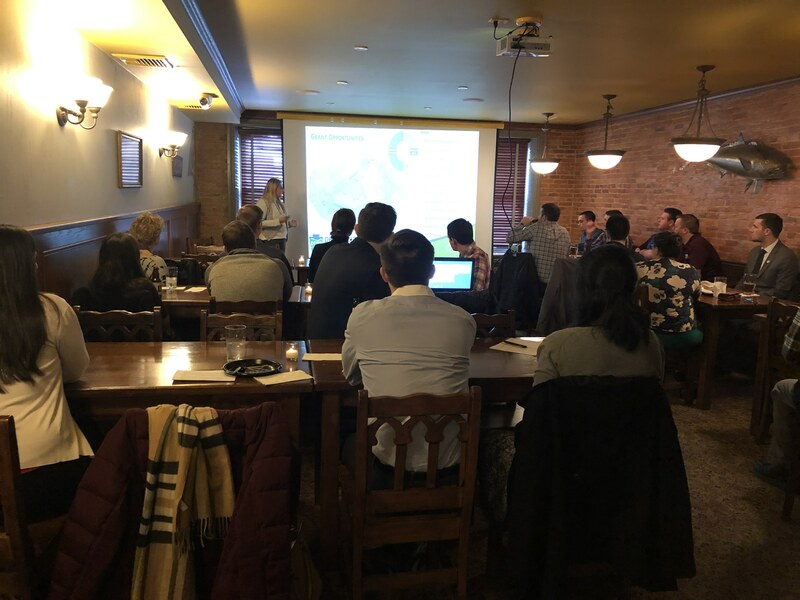 On Wednesday, March 20, 2018, the Philly YMF gathered with members of the Delaware County Section of the Pennsylvania Society of Professional Engineers (PSPE) at Sligo in Media, PA. Over 20 attendees enjoyed networking and small bites co-sponsored by the YMF and PSPE, followed by a series of brief technical presentations with one PDH being offered to participants! Megan Todaro from Pennoni, presented on park and playground grant rehabilitation projects; Scott Cepietz from Michael Baker International, presented on the SR 222 and SR 662 multi-lane roundabout; and Joshua Pudleiner from AECOM, presented on the preservation of suspension bridges. All three presentations were not only informative but engaging and well received. The YMF would like to extend a thank you to all presenters, attendees, and PSPE for yet another successful year of this event! Click the picture below for more photos from YMF events! On Wednesday, Feb. 27, the YMF hosted a professional development event at Tir Na Nog in Center City Philadelphia. The event, hosted by Kevin Walsh, the YMF Professional Development Chair, included a PDH presentation on placemaking. 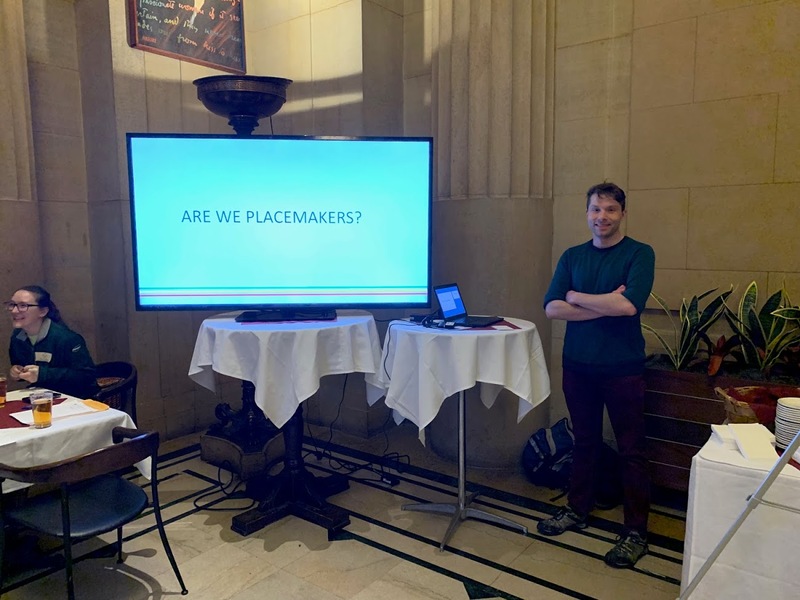 Given by Matthew Reese, a professional engineer at Urban Engineers, the discussion explored the connection between placemaking and engineering—how design impacts a city’s economics, safety and well-being. The presentation was followed by a lively Q&A session. Afterward, the 30 ASCE YMF members and guests in attendance enjoyed the complimentary appetizers and snacks as they networked. Keep an eye out for the YMF’s next professional development event: Critical Issues Seminar. This PDH event is one of the YMF’s largest and widely attended, and will be held this upcoming May. More details to follow in the YMF email blasts. 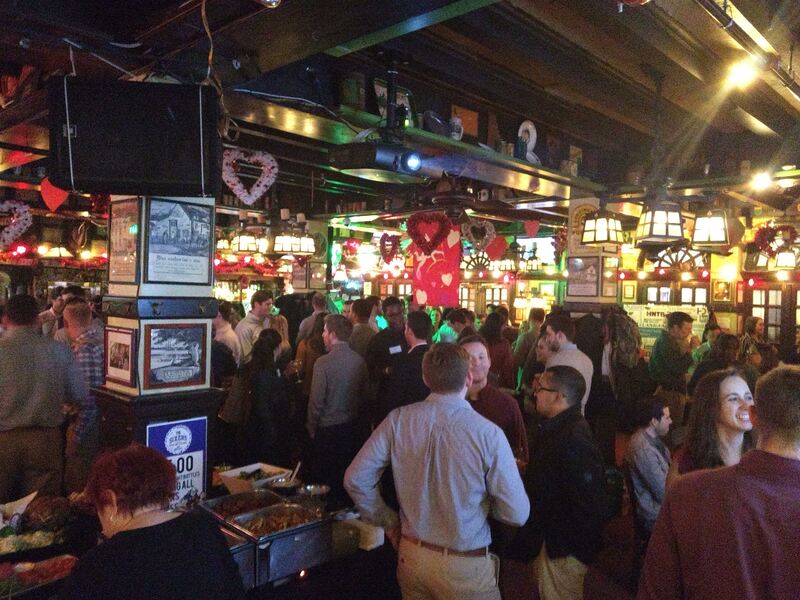 On Monday, February 4th, the YMF once again hosted the annual Winter Social at McGillin's Olde Ale House. 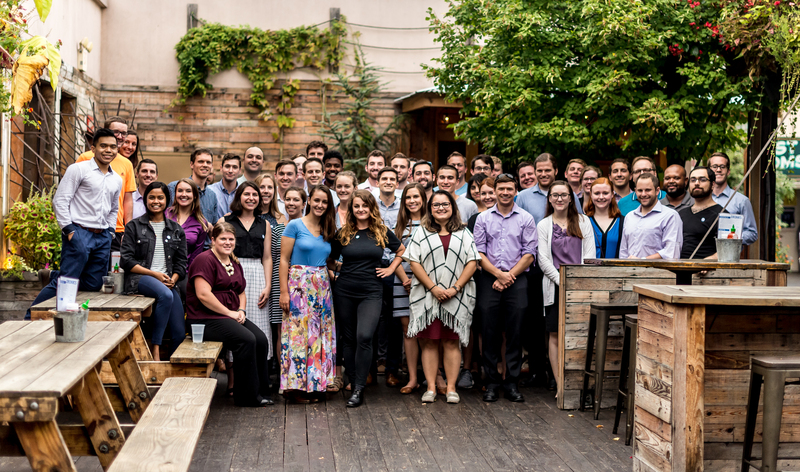 In its more than 20th year, the event was another great success with over 170 local, young engineers (including some young at heart) in attendance for a night of networking, food, drink, and fun. As part of the event, the YMF also held its annual charity raffle. Fueled by donations from over 30 local engineering companies, the raffle raised more than $4,000 to benefit local non-profit organizations and STEM initiatives, such as the Future City competition, Friends of the Wissahickon, and Life Do Grow farm, among others. The YMF would like to extend its sincerest thanks to all of our donors for their continued support, as well as to everyone who came out to the event and supports the YMF in other ways throughout the year. We could not do it without you! 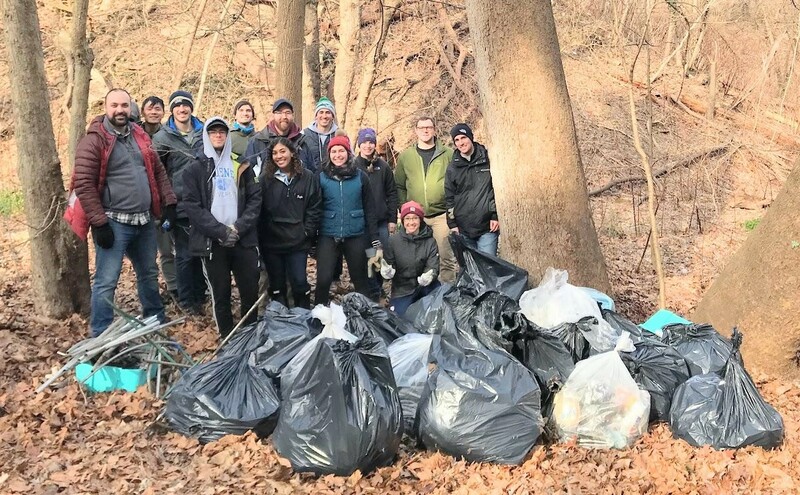 On Saturday, January 12th, 2019, ASCE YMF board members Scott Cepietz, Jesse Gormley, Caroline Voigtsberger and Joe Natale, along with 9 other volunteers, partnered with Shawn Green from the Friends of Wissahickon to clean up a section of the Yellow Trail in Wissahickon Valley Park. The volunteers completed the removal of an encampment that had been a hazard in the park since the summer, and cleaned a very densely littered section of trail near the Henry Avenue Bridge. Despite the cold start to the day, volunteers stayed warm and collected 23 large bags of trash and recycling, as well as one human arm-full of aluminum and steel piping, and a small boat motor. Look for the next community service event in the coming months! 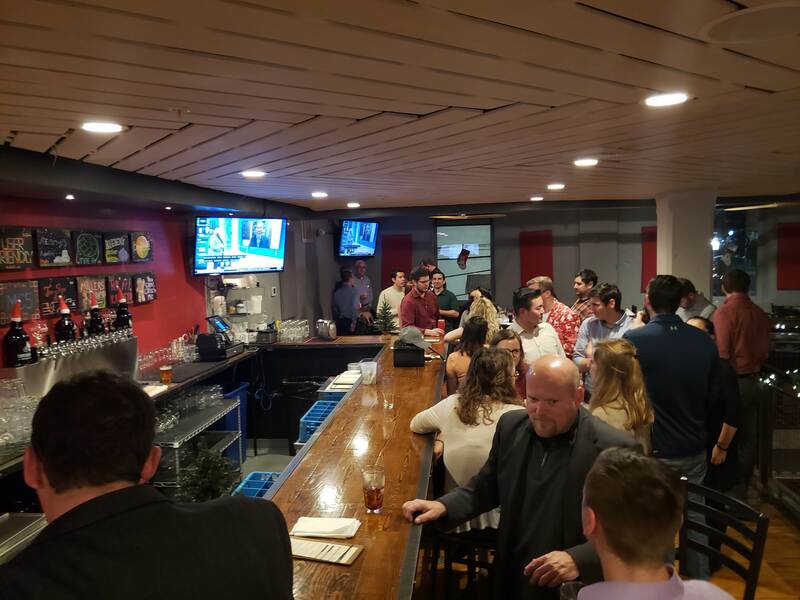 On Thursday, December 13th, 2018, the ASCE Philly YMF teamed up with the ASHE Delaware Valley for a joint happy hour at Conshohocken Brewery Company in Bridgeport, PA. There were about 55 attendees that enjoyed happy hour specials and an amazing selection of appetizers. Door prizes were also raffled off for those in attendance. It was nice to have the event outside of the city so that members that can’t usually make it to the events in the city got a chance to come out and network. This was the annual joint event and we certainly look forward to working together again in the future. 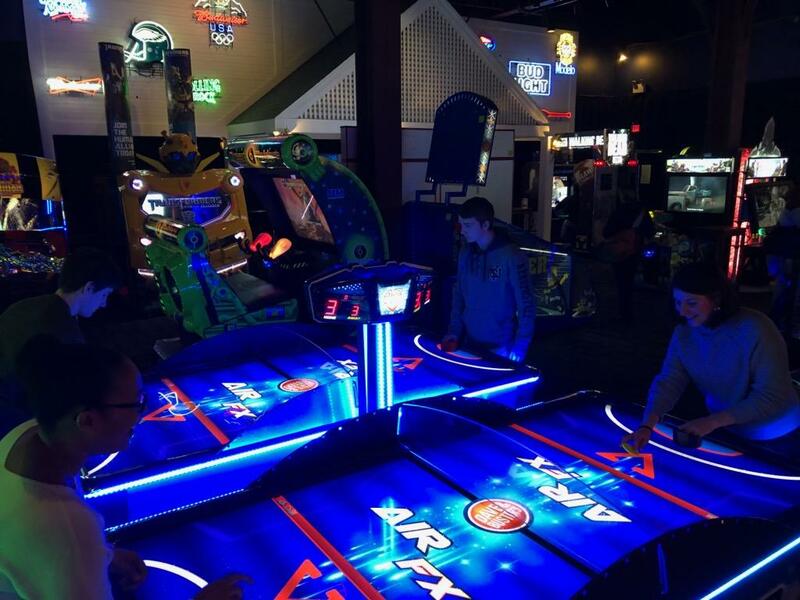 On Tuesday, November 13th, students and professionals attended the ASCE Philadelphia YMF’s Student Night at Dave & Buster’s. 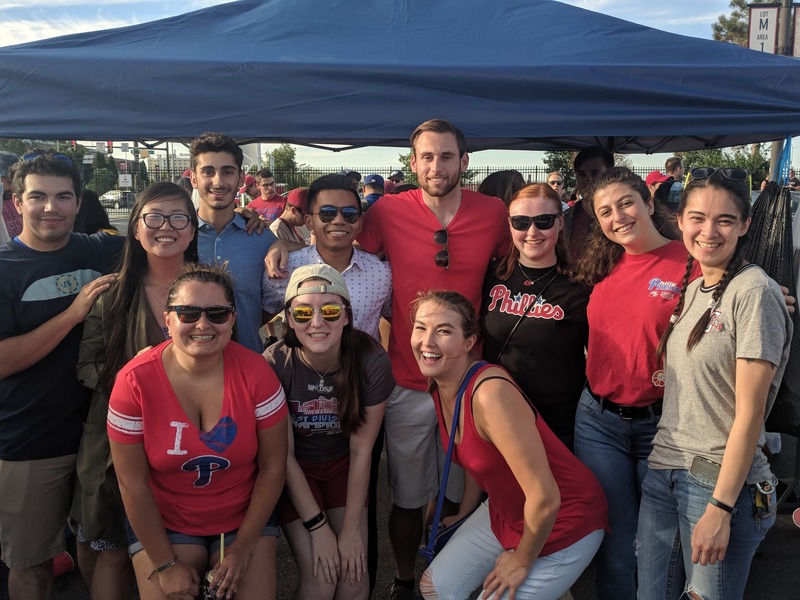 This event was the ASCE Philadelphia YMF’s annual Welcome Back Students event which welcomed back local civil engineering students from Drexel, Temple, Villanova and Widener Universities. The event began with an hour of eating/networking followed by YMF college contact co-chair Jake Nichols giving announcements for upcoming events, scholarship opportunities, and information about our mentorship program and mock interview program. The group then enjoyed having fun and playing games with their free Power Cards. 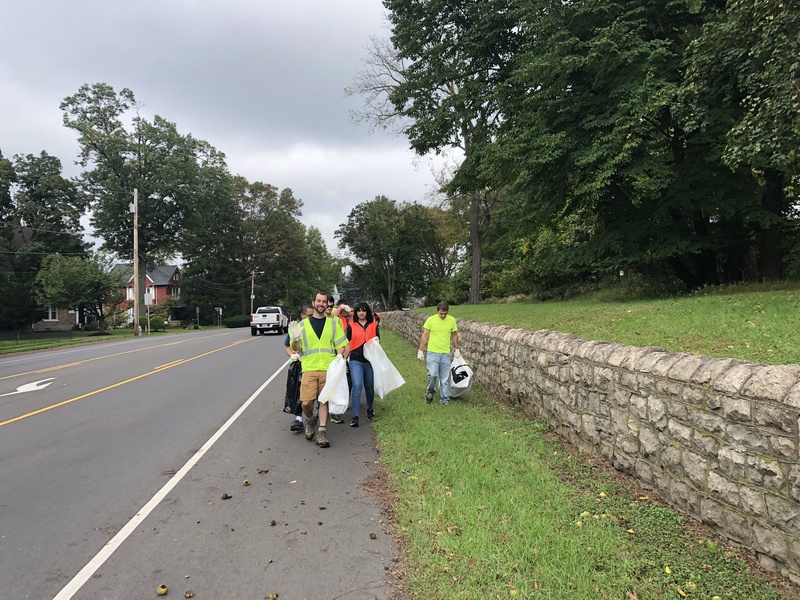 On Sunday October 7, 2018, ASCE YMF board members Kevin Brown and Joe Natale, along with 12 other volunteers, participated in a joint ASHE/ASCE Adopt-A-Highway street clean-up. The volunteers cleaned up a 2 mile section of Bethlehem Pike in Ambler, PA, and luckily the sun stayed hidden for most of the day! After the clean-up, the group enjoyed food and refreshments at the Fireside Bar and Grille where they were able to socialize and relax. Look for the next adopt-a-highway cleanup in the spring, and other community service opportunities this fall! 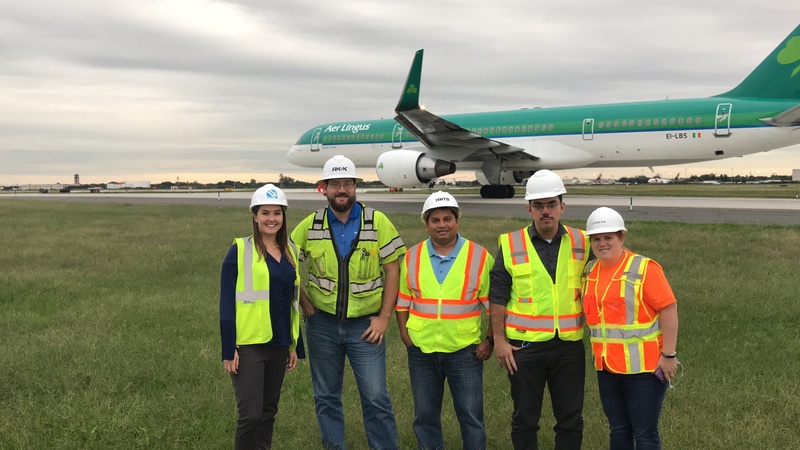 On Thursday September 27, the ASCE Philadelphia YMF held a tour at the Philadelphia Airport. The group was split into two small groups that switched between the airfield tour and a PDH course. The Airports 101 course was taught by Dave Benner from Urban Engineers. The tour went throughout the airfield and focussed on the Runway 27L extension project. The group learned how airports are designed and saw these design elements in place at PHL. After the tour, the group went to Coaches Bar and Grill for networking and discussion. The YMF gathered at Morgan's Pier to celebrate the final days of summer with the annual group photo. The group photo was taken around 6PM and then everyone proceeded to enjoy appetizers and drinks amongst the company of their fellow members and colleagues. While the weather forecast showed storms, it turned out to be a beautiful, clear night with almost 50 people attending the event and making it a complete success! 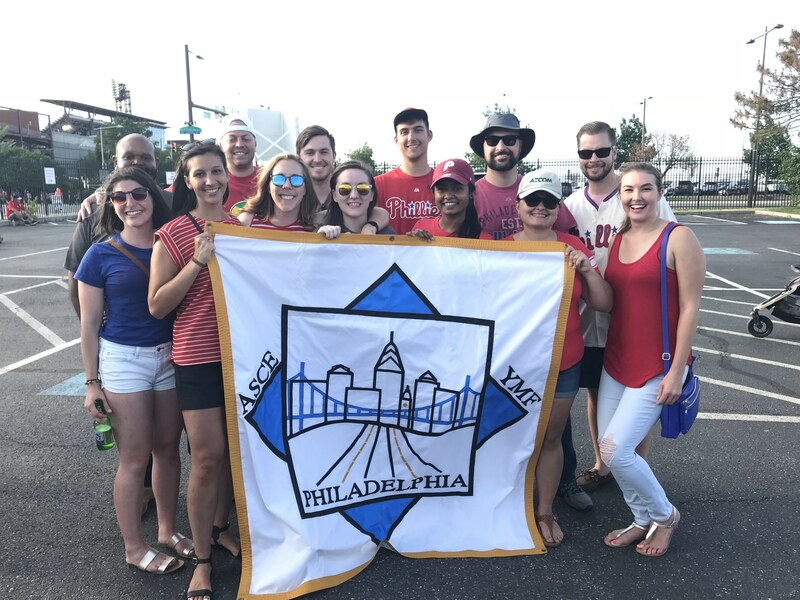 On Friday, July 20th, the ASCE Philadelphia YMF hosted their annual Phillies Game and Tailgate event. The event was well attended, with over 100 attendees ranging from college students to section members. 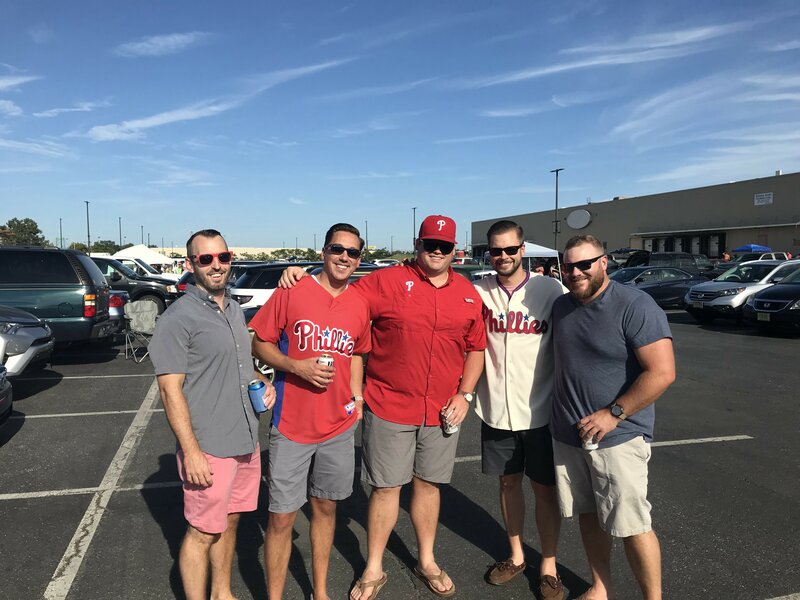 The weather was perfect and the tailgate was very well received. Thanks to everyone who came out and made for a great end of year event!